Due to safety concerns, we are cancelling the 42 & 68 mile ride out of concern for riders & volunteers. DELAYED START TIMES for other events. Details & info about weather updates here. 2:00 PM Ride course closed. All riders must be back. This is our 11th Annual event! The ride begins and ends at Georgetown High School in Georgetown, TX, and benefits the Autism Society of Texas. All proceeds are used to fund programs, promote education and awareness, and provide access to resources for families and adults living with autism in Texas. Registration is $50 for all bike ride distances for each participant. The Fun Run/Walk is $25 for the first person and $10 for additional family members for the Fun Run/Walk. The registration fee includes an event T-shirt* as well as lunch and snacks and drinks at multiple rest stops along the routes. It also includes access to the Resource Fair, bounce houses, as well as games and activities! If you can't make it out to the ride/run then you can also register as a fundraiser for free. ROUTES are of approximately 9, 24, and 42, and 68 miles with START & FINISH at Georgetown High School. All routes pedal through moderately flat terrain interspersed with rolling hills on the eastern side of Williamson County. Riders must obey all traffic laws. Helmets must be worn. Rest stops will be available throughout the ride. SAG vehicles will be patrolling the routes to help with mechanical troubles and to pick up riders with any problems. Please be prepared to handle your own flats and minor problems. Since the roads are not closed, all bike rides are recommended for older elementary aged children, or tweens/teens who are riding with an adult 18+. RIDE STARTS AT 7:30 am with no riders leaving after 9:00 am. All riders must finish by 2:00 pm, so choose a route that gives you plenty of time to finish. The 5K Fun Run/Walk at Georgetown High School is suitable for younger children who want to bike, walk, or run. Strollers welcome! The 5K Fun Run/Walk will be a different course this year, with 5 laps around Georgetown High School grounds at the resource fair area in order to avoid parking lots. The walk and fun run will begin at 10:00 am and the post-event party will follow. See the full event schedule for more details. Onsite registration will be available the day of the event, but we suggest you register in advance to save time, guarantee your t-shirt size, and help us better plan for the event! Thank you! Review maps & parking information here. The event is rain or shine and refunds are not available due to weather. The event is rain or shine. In the case that any bike rides have to be delayed or cancelled due to rain, we will send you an email and announce on social media. If there is light rain the 5K will continue and we have the ability to move the Resource Fair indoors. We will cancel the whole event (Resource Fair and Fun Run) only if there is dangerous weather- i.e. lightning/tornadoes/severe storms. 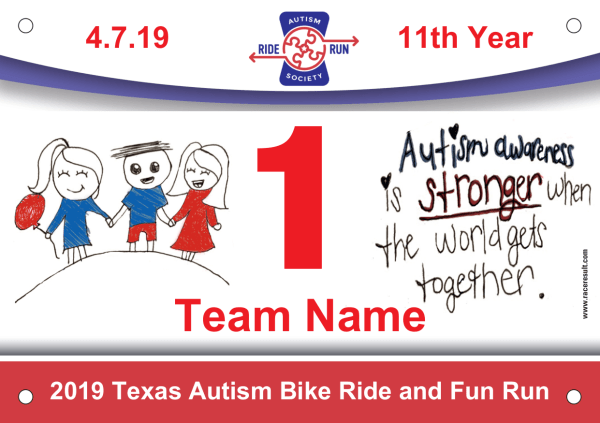 Please check our Texas Autism Bike Ride Facebook page & Twitter for event information on Sunday morning in the event of rain or other bad weather. Thank you for your understanding. The weather currently shows a 50% chance of rain for Sunday. We hope this will change, but please be prepared and bring rain gear. *T-shirts: Register by 3/15/19 to guarantee your t-shirt size & delivery at event. After 3/15 we cannot guarantee size, and you may receive it after the event. The ride benefits Autism Society of Texas, which provides support and advocacy for people in our community living with autism. We need volunteers to make this event happen! If you are interested in volunteering at the event or helping out during event planning before the event, please sign up here. 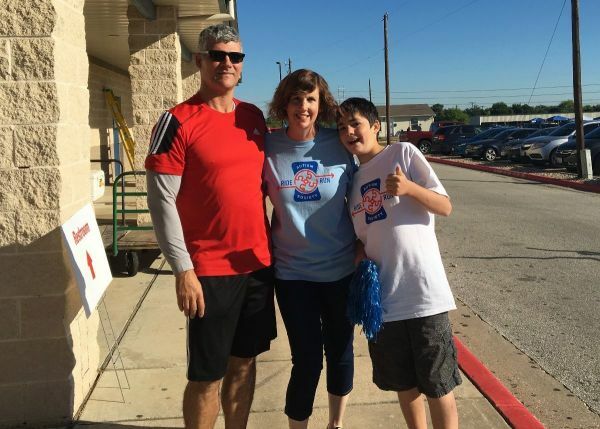 Why should you do the Texas Autism Bike Ride and Fun Run? Money raised here, stays here, and goes to support core services of the Autism Society of Texas. This year we are excited to celebrate our 28th anniversary providing autism support, information and referrals to thousands of families.We need sponsors to make this event happen. If your company can support the 2019 Texas Autism Bike Ride and Fun Run with a cash or in-kind sponsorship please sign up as a sponsor. You can find out more about sponsorship opportunities here. Great prizes for top fundraisers! Raise $500 & get a jersey! By raising a total of $500 to benefit the Autism Society of Texas, you will receive a limited edition 2019 Autism Bike Ride Jersey. You can learn more about all the fundraising incentives here. Check out our awesome bibs! Those who raise $250 by the 3/24/19 deadline will get their name or team name on their bib! Check out the 2019 bib! We couldn't do it without our sponsors! For information about sponsoring the 2018 Autism Bike Ride and Fun Run click here.